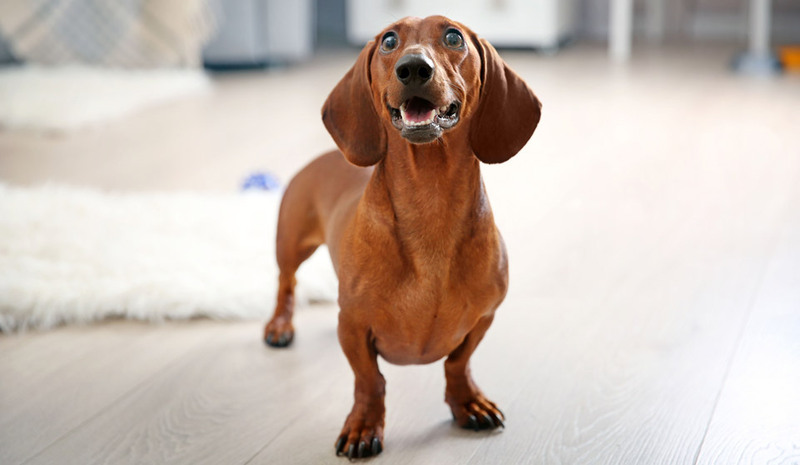 The exact origin of the Dachshund is unknown, however the most commonly accepted theory is that it originated in Germany during the fifteenth century. There is also evidence that suggests that the breed may have been present in Greece, Egypt, China and Mexico. The Dachshund was originally developed to hunt badgers, its short legs and long body allowed it enter the badger’s den easily. They were officially recognised in 1888 when the German Dachshund Club was founded to strengthen and promote the breed. These dogs are full of personality, out-going and playful and make lovely companions but do have a stubborn streak which can make them difficult to train. Dachshunds sport a variety of hair types including smooth, long and wirehaired coats and can be seen in a number of colours. Black & tan and red are the most common. Discourage too much jumping onto or off heights and stairs. Lift onto and off heights were possible or provide ramps. Average lifespan is 12 to 15 years. Intervertebral Disk Disease – Degeneration or displacement of disk material in the spinal column causing pain, weakness and possible paralysis. Progressive Retinal Atrophy (PRA) – Progressive degeneration of the retina eventually causing blindness. Cord Lipofuscinosis(NCL) – Degenerative changes in the brain and spinal cord. Cancer – Both male and female dogs are prone to mammary tumours. Hypothyroidism (Underactive thyroid gland) – Seen in middle aged dogs, common signs include obesity, lethargy, skin and ear infections. Cushings (Overactive adrenal glands) – Resulting in skin problems, excessive drinking and pot-bellied appearance. Cataracts – Clouding of the lens causing blurred vision to blindness. Glaucoma – Increased pressure in the eye, resulting in pain, altered vision and blindness. Atopic dermatitis – Hypersensitivity to environmental allergens causing intense pruritus and inflammation of the skin resulting in skin trauma and infection.